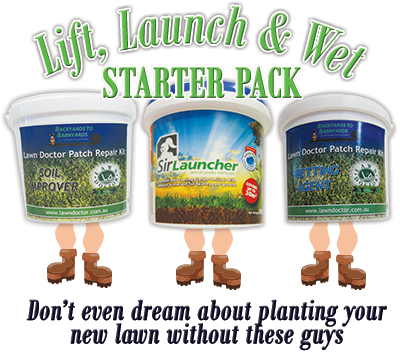 Don’t Forget to order your great value Lift, Launch and Wet Lawn Starter Pack when you order your turf. The pack is made up of your soil conditioner, starter fertiliser and wetting agent. All 3 products are applied directly underneath the turf prior to laying. 2.Sir Launcher – A starter fertiliser designed to promote strong roots, necessary during water restrictions, with the added bonus of Water Crystals. Water Crystals are small organic beads that swell up too many times their size when wet. These Water Crystals then release this stored water over a continuous period of hours, keeping your baby roots wet between watering times and ensuring they don’t dry out. Allowing your roots to dry out can set the establishment time back by weeks and is the most common reason for turf failing after planting. 3.Wetting Agent – A wetting agent is necessary in WA’s waxy soils. Wetting agents stop the soil becoming anti wetting, which leads to the precious water you apply being wasted as it runs of your turf and down the road. A wetting agent should be applied once at planting and a couple more times over the spring summer period.